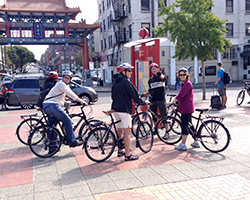 Seattle Cycling Tours takes visitors on rides through many of Seattle's historic and colorful neighborhoods. In 1851, when the 22 members of the Denny Party arrived at Elliott Bay on the shores of the future city of Seattle, they set in motion a series of booms and busts that continue today. 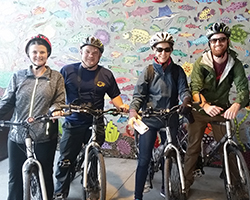 And while current changes may seem overwhelming, a Seattle city tour from the seat of a bicycle or on foot is the perfect way to keep it all in perspective. “One of the aspects of Seattle history that makes it nice is that it’s relatively short. Post-settlement, the story is only 170 years old,” says writer David B. Williams. Because the city has preserved landmarks, “We can still see and feel our early history,” Williams adds. 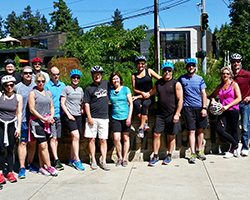 As Craig Scheak with Seattle Cycling Tours. 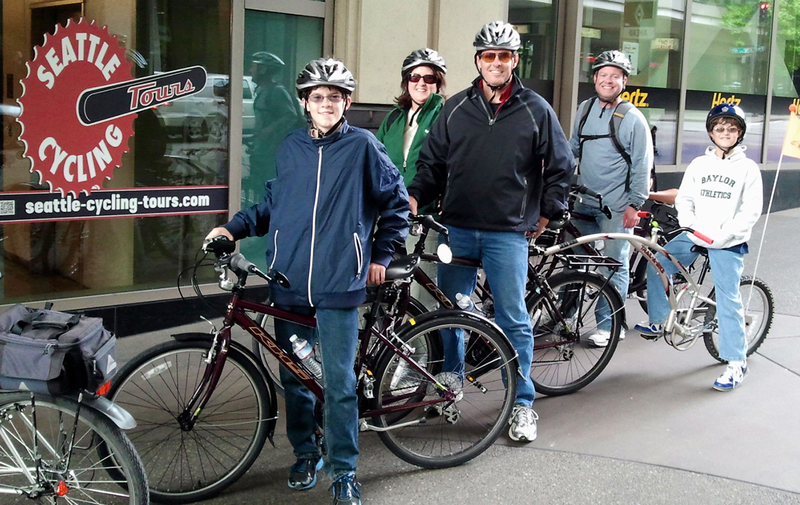 sees it, there’s no better way to click with Seattle’s past than a bike tour. “You have more of a chance to connect with other people and to see stuff you can’t from your car,” says Scheak, who has lived in Seattle for nearly 60 years and has been commuting to the city by bicycle for nearly half of that time. The long-time resident’s carefully plotted routes along a network of bike paths avoid the city’s notoriously steep hills and construction tied to Seattle’s latest boom. In a little under three hours, his basic Seattle tour covers history of popular neighborhoods in the downtown core, including the Waterfront, Seattle Center, Pioneer Square and the International District/Chinatown. Scheak also offers tours of Ballard, Georgetown and Bainbridge Island. 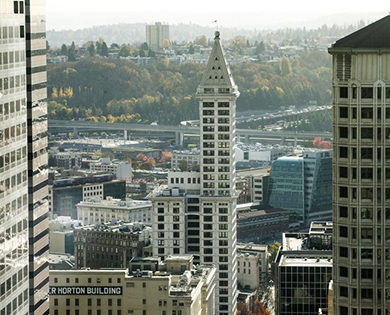 Smith Tower was once the tallest building in Seattle but is now dwarfed by surrounding skyscrapers. 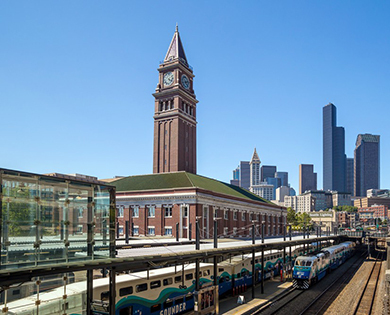 King Street Station is Seattle's SoDo area is a historic landmark and a great way to arrive for Mariners games. 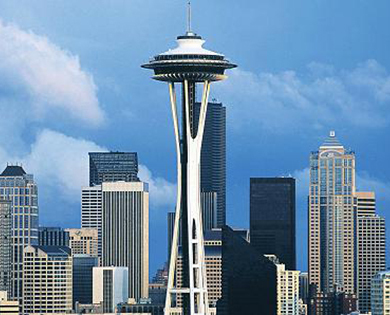 Located in the Seattle Center, the 605-foot tall Space Needle is still one of the most iconic visitor attractions in the city. As guests on his small group tours pedal comfortable city commuter bikes, Scheak shares tales of Seattle’s past, including its arguably oldest skyscraper Smith Tower (built in 1914), which today has historical exhibitions in its lobby and an observatory and speakeasy-style bar on the 35th floor; transportation hub King Street Station. (built between 1904 and 1906) – its soaring clock tower provided a standard of time for early Seattleites; and more contemporary landmarks such as the Space Needle., which was built for the 1962 World’s Fair and is currently undergoing a $100 million remodel. Scheak loves sharing the history of his city with visitors and new residents. “I look forward every season to the surprises that will unfold … and that there are always new variables that I could never imagine happening, happening.” Sort of like Seattle itself. Pioneer Square is the birthplace of Seattle and a colorful district in which to spend some time. 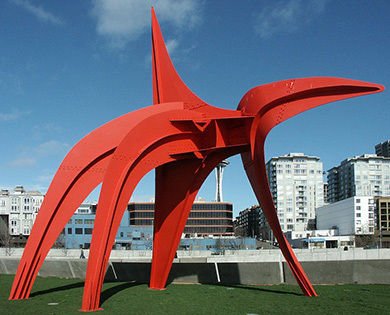 Managed by Seattle Art Museum, the Olympic Sculpture Park is located near Pike Place Market. 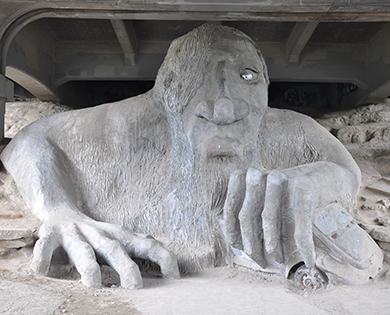 The Fremont Troll is one of the quirky and fun oddities you'll discover on a neighborhood walking tour. Walking is also a great way to see the city. “… you’re moving at a slow pace that allows you to stop and look and observe things that you just can’t otherwise see,” Williams says. Williams’ latest book Seattle Walks: Discovering History and Nature in the City provides the compelling back story to the city’s historic streets and buildings. He points out Seattle’s early construction continues to impact the city in ways that are especially noticeably to pedestrians. “You’re aware that a sidewalk is tilted because the street is sinking because the building was built on piers or pilings and the street isn’t,” he says. Walking or pedaling through Pioneer Square, near where the Denny Party arrived and home of the city’s first “downtown,” may be the best way to sense Seattle’s past. 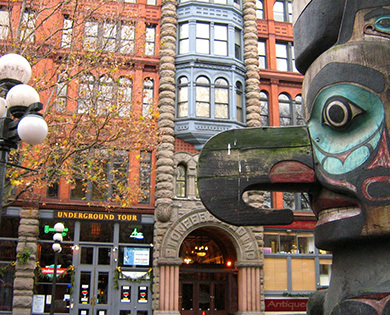 Pioneer Square includes a tribute to Chief Seattle, the Suquamish tribal leader for whom the city is named. 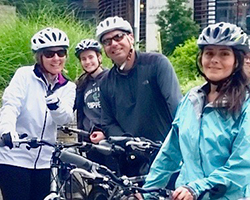 If you go: Check schedules and book Seattle Cycling Tours in advance at their online site. Custom tours are also available. Cyclists need moderate experience and fitness levels. Riders must be 12 or older. Tours depart from Pike Street near the Washington State Convention Center. David B. Williams leads occasional group walking tours. Learn more at his website.